The company that started in a rented bungalow with a capital of Rs 25,000 and achieved a turnover of around Rs 1.25 lakh in its first year of operation has come a long way: it has three innovative medicines to its credit - Polycap (for prevention and treatment of cardiovascular diseases), Risorine (for treatment of tuberculosis) and the recently introduced Mycidac-C, the world's first active immunotherapy in lung cancer. Veteran industrialist Indravadan A Modi had quit his job as a chemist in a Mumbai firm to start Cadila Laboratories with childhood friend Ramanbhai Patel in 1951. In March 1952, Cadila started production. The founder-chairman of Cadila Laboratories (renamed Cadila Pharmaceuticals after its 1995 restructuring), who steered the company for many decades, died in November 2012. 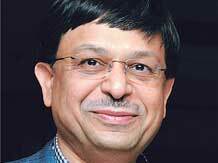 Meanwhile, he had inducted his biotechnologist son, Dr Rajiv Modi, into the company in 1991. When the Modi and Patel families decided to split the business in 1995, two entities were formed - Cadila Pharmaceuticals (owned and controlled by I A Modi and Rajiv Modi) and Cadila Healthcare (owned by the Patel family). Rajiv Modi and I A Modi worked closely to run Cadila Pharma, now considered one of the largest privately-held pharma companies in the country, with revenues of around Rs 1200 crore. After the death of Modi senior, Rajiv Modi became chairman and managing director of Cadila Pharma. He, however, denies that there was any clear-cut transition, as both father and son had worked together to run the company for years. He describes it as more of a natural progression. Modi is a PhD in Biological Science from the University of Michigan, Ann Arbor, USA. He is also an MSc in Biochemical Engineering from University College, London and a BTech in Chemical Engineering from the Indian Institute of Technology (IIT), Bombay. Focus on innovation is a major thrust area for Modi. He recalls that in an informal chat with his father one day, the two spoke about their vision for taking the company forward. The two eventually decided that after keeping a share of the profits, a major portion of the revenues would be pumped back into research and development, in a search for innovative products. Therefore, upon assuming the leadership of Cadila Pharmaceuticals, Rajiv Modi charted a multi-pronged approach to growth which sought to enhance the growth rate in revenues, focus on developing innovative products - a high-risk strategy - and expand the company's presence in overseas markets. Envisioning a global presence for the group, Modi established marketing networks and subsidiaries of Cadila Pharmaceuticals across the world. The company has operations in the US, Japan, the Commonwealth of Independent States (CIS), and Africa, with its first overseas formulations manufacturing unit at Addis Ababa in Ethiopia. Cadila Pharma has a strong focus on research. Being a biotechnologist himself, Modi has played a major role in developing the company's biotechnology division into a strong research and development unit, focusing on breakthrough innovations. Collaborative research in biotechnology is being carried out at various national and international research laboratories, such as IMTECH, Chandigarh; IISc, Bangalore; NII and CBT, New Delhi; ICGEB, New Delhi and Trieste, Italy. Cadila Pharmaceuticals has entered into joint ventures and strategic collaborations with Apollo Hospitals (Gujarat); Bactiguard AB, Sweden; Heleperby Therapeutics plc, UK; Novavax Inc, USA; Pergamum AB, Sweden; and Stemcyte Inc, USA. It invests in developing innovative products in the areas of vaccines, antibiotics and pain management, among other areas. For example, Cadila's joint venture with Novavax focusses on developing new vaccine candidates, using virus like particle (VLP) technology. The partnership with Heleperby focusses on developing new compounds called antibiotic resistance breakers, which, when combined with old and obsolete antibiotics, can rejuvenate them and make them active against highly-resistant bacteria. Rajiv Modi admits that being an innovation which needs significant investment in R&D is a risky business, because, after years of expensive research, the results might not be on expected lines. Nonetheless, he is willing to take his chances, and intends to make Cadila Pharma one of the major innovative pharma companies globally. One reason why Cadila Pharma has consciously chosen not to list is to ensure that it is free from pressure from the investor community, and is able to follow its own chosen path. In line with the vision of founder Indravadan Modi, who wanted to develop quality medicines for the masses at affordable prices, Modi junior believes that even innovative drugs should not be exorbitantly priced. Cadila launched Mycidac-C, its latest cancer drug, at an affordable price point, lower than other available treatments in the market. Modi is an active participant in activities related to the development of Gujarat. As a part of Vibrant Gujarat celebrations, he led the industrial delegation from the state to Japan in 2009 to strengthen business ties between the two countries. Eventually, Japan became the partner country in Vibrant Gujarat. He has also been nominated to the steering committee of the Gujarat Chamber of Commerce and Industry. He is chairman of the Confederation of Indian Industry's Gujarat state council.